Did chaos theory kill the climatology star? Last time, we saw that some mathematical systems are so sensitive to initial conditions that even very small uncertainties in their initial state can snowball, causing even very similar states to evolve very differently. The equations describing fluid turbulence are examples of such a system; Lorenz’s discovery of extreme sensitivity to initial conditions ended hopes for long term weather forecasting. Because the state of the weather can only be known so well, the small errors and uncertainties will quickly build up, rendering weather simulations useless for looking more than a few days ahead of time. But Lorenz’s discovery doesn’t have much impact on climate modelling, contrary to the claims of some climate skuptix. Climate is not weather, and modelling is not forecasting. Many climate skuptik talking points derive from confusing these two quantities, in much the same way that a gambler might win a few hands of poker and decide that they are on a roll. Although it is generally not possible to predict a specific future state of the weather (there is no telling what temperature it will be in Oregon on December 21 2012), it is still possible to make statistical claims about the climate (it is very likely that Oregon’s December 2012 temperatures will be colder than its July 2012 temperatures). It is very likely that the reverse will be true in New Zealand. It is safe to conclude that precipitation will be more frequent in the Amazon than in the Sahara, even if you can’t tell exactly when and where that rain will fall. Fig. 1. Three solutions of the Lorenz equations, starting at virtually identical points. Although the solutions are similar at first, they rapidly decouple around T=12. The Lorenz equations consist of three variables describing turbulent fluid flow (X,Y, and Z), and three controlling parameters (r, b, and s). The equations are differential equations, meaning that a variable is described in terms of how it changes over time- saying ‘Johnny is driving west at 60 miles per hour’ is a simple differential equation. In order to solve a DiffEq, you need an initial condition – “Johnny started in Chicago” is an initial condition; without knowing that, you can’t say where she will be after driving for three hours. … where V’ is the time derivative of variable V.
Fig. 1, above, demonstrates this model’s sensitivity to initial conditions. Even though the three simulation runs start off almost exactly the same, they slowly drift, and then spontaneously fly apart, quickly losing any similarity to each other. 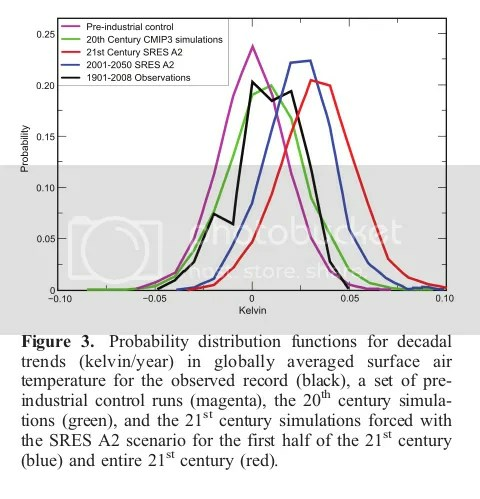 This quick catastrophic divergence might seem like it would doom a climate model, but remember that climate is defined statistically, and even very dissimilar runs can have consistent statistical behavior. Fig. 2. The mean value of the variable Z in the Lorenz equations. 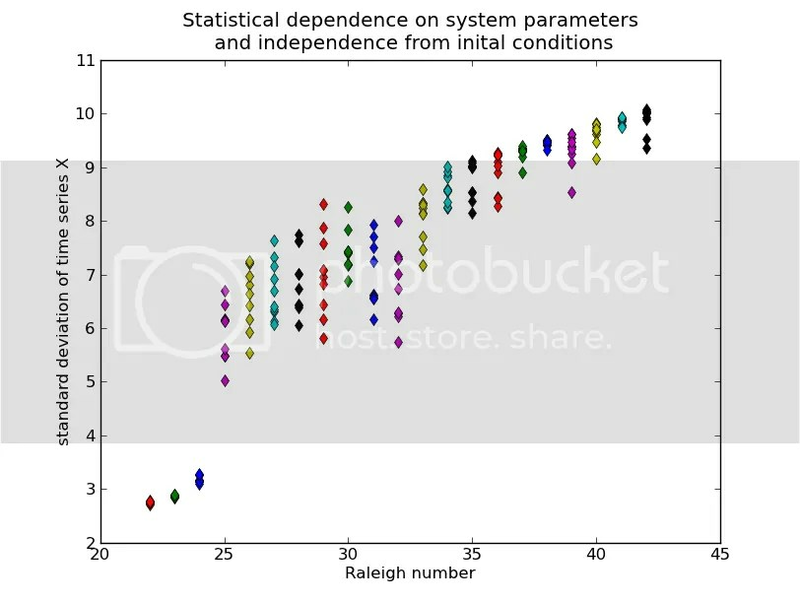 At each value of the Rayleigh number, the Lorenz system is solved with 10 different starting conditions, with s = 10 and b = 8/3. Here’s an example. In Fig 2, I’ve varied the parameter r (more on that in a second – for now, concentrate on the canonical Lorenz value of r=28) and then solved the Lorenz equations with a number of different initial conditions. Then, I found the average value of the output of variable Z (interpreted as a measure of the heat profile in the turbulent fluid). The values of mean(Z) are very tightly clustered, meaning that the initial conditions didn’t influence the average very much. Fig. 3. The standard deviations of a Lorenz variable from an ensemble of simulations, as a function of the Rayleigh number. 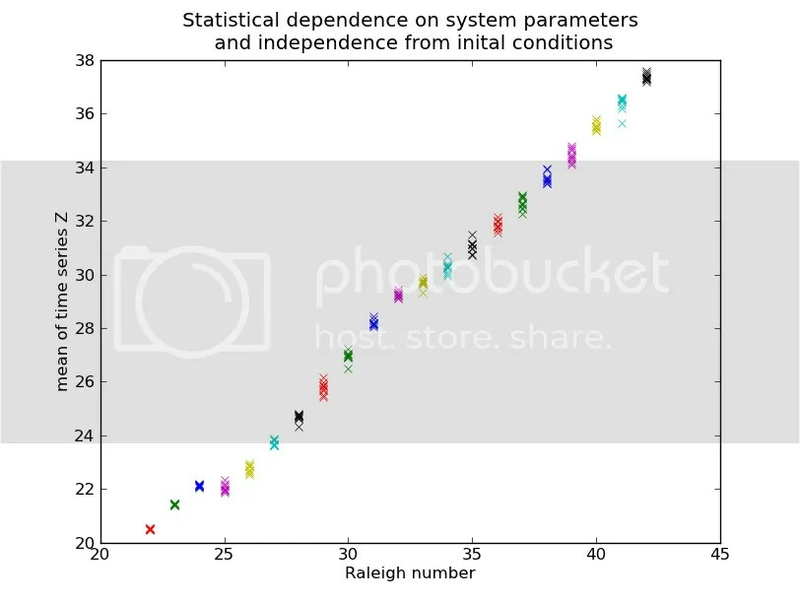 They're not as tightly clustered as the means were, but they still appear well-behaved - the 'climate' of the Lorenz model can be described in spite of chaos! 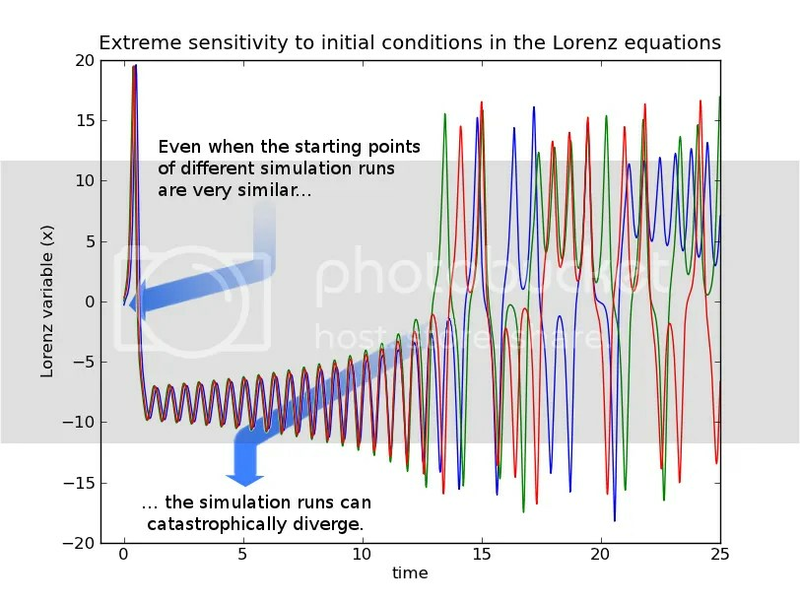 The Lorenz equations are a canonical example of extreme sensitivity to initial conditions. However, their chaotic nature is not an obstacle to making statistical claims about their behavior. Climate is defined statistically, so the fact the weather is chaotic is not a barrier to climate modelling. James Gleick. Chaos: Making a New Science. 1987. Stephen Strogatz. Nonlinear Dynamics and Chaos. 1994. Lorenz equations modeled with software adapted from that available from TitanLab. Some of the best writing on the details of why we can predict climate when we can’t predict weather.